Kohana here again just felt like doing up another article. This time on one of my old favorites, Uncharted Waters: New Horizons. 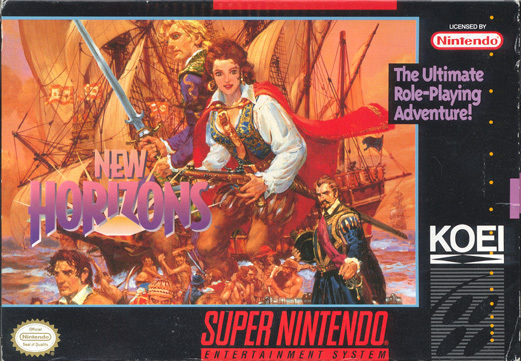 Uncharted Waters: New Horizons is a fairly unique RPG for the SNES and was also ported for the PC. The game takes place in the early 16th century in the age of exploration. Gameplay is divided into 3 different major parts: trade, exploration, and combat and assigns your main character a fame score for each category. There are 6 main characters to choose from each having their own plot along with being a trade, explorer, or combat character. The type of the character relates to which type of fame must be increased to advance the plot though you’re pretty free to do what you want and can pursue the plot at your own pace. Earning exploration fame involves mapping out the world, making discoveries, and finding ports. Your main opposition with exploration is keeping your crew fed and having enough water. This is simple at first as ports are very common however the further you get from main civilization the less ports you’ll find. Getting trade fame simply involves investing in ports. However this requires a lot of money which is best obtained through clever trading. Profitable trading simply involves buying low and selling high which isn’t nearly as complex as in say the Patrician series. There is a tiny bit of complexity but nothing too bad as this game is more of an RPG rather than a simulation. Gaining combat fame is quite straightforward. You simply need to pick fights. You can’t do it indiscriminately however otherwise you’ll end up making everyone an enemy. Ship combat plays out in a turn based tactical style taking turns back and forth moving your fleet around, firing, and such. If you get your flag ship next to the enemy flag ship you can challenge the enemy captain to a duel. This is nice in that if you win, the battle is over and you can claim what you want, however the reverse is also true giving you a game over if you lose. Despite playing so much I never totally figured out how dueling works but it seems to be some rock, paper, scissors style card game. I generally just get the best armor and weapon I can find, pick the card with the highest value and hope the enemy doesn’t draw the card that counters mine. I’ve found this game to be very fun and completed it many times. It’s very simple to pick up and play and light on plot so you spend most the time actually playing the game. If you go straight through the plot most characters don’t take too long to finish however especially in the combat ones unless you’re very good at it this might be a bit hard. It’s a great fun game. Unfortunately the SNES cartridge is probably a bit hard to find and the PC version isn’t quite as nice. A great site on the game can be found at http://www.unchartedwatersnewhorizons.com/ . There is also a download for the PC version but I’m not sure exactly if its freeware or “abandonware”. I checked the Koei site to see if I could get any information on it however even their archive section only lists games as far back as 1997 so it wasn’t much help.